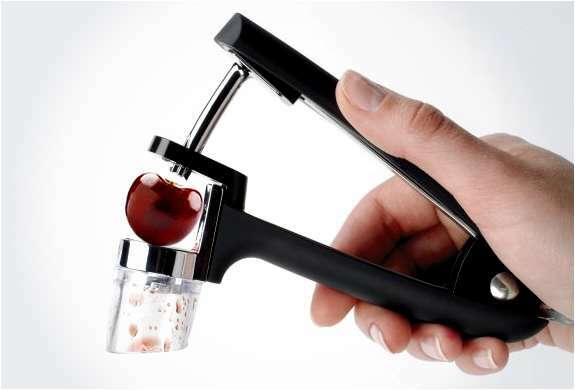 Have you ever tried to remove pits from cherries without using a cherry pitting tool? Well, it’s easier than you think. There are a couple of methods that do the trick, but be warned- the process is messy. You might want to wear latex (non-powdered) gloves to protect your manicure, and you’ll want to keep paper towels handy! To Begin: Wash the cherries and pat away the excess moisture. Remove the stems. Method 1: This method works best on cherries that are a bit soft, but not mushy. If you happen to have one sturdy chop stick, it’s a snap. Poke the chopstick through the stem-end of the cherry, and push without hurting yourself! The pit will –eventually- pop through the other end. Now that you have the knack, and a bowlful of pitted cherries, here’s a simple, dessert to enjoy before cherry-season is over. 1. Do Ahead: Combine the cherries and sugar in a bowl. Cover and refrigerate for several hours or overnight. 2. Place a strainer over a bowl and drain the cherries. Do NOT discard the cherry syrup! Set the cherries aside. 3. Place yogurt into a mixing bowl. Blend the cherry syrup into the yogurt. Stir in the honey and vanilla extract (or rosewater, if preferred). 4. Set out 4 - 8 ounce tall glasses or parfait glasses. Spoon 1/4 cup yogurt into the bottom of each glass. Distribute an equal portion of cherries among the glasses. Sprinkle pistachios over the cherries. 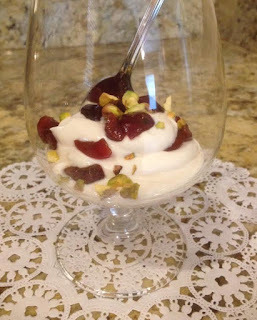 Repeat the layers (yogurt-cherries-pistachios) but do not sprinkle the top layer of pistachios until you’re ready to serve. Cover and chill for at least 1 hour. Just before serving, sprinkle the remaining chopped pistachios on the tops. Note: The parfaits may be assembled and refrigerated one day before serving. BUT, do not sprinkle the top layer of pistachios until just before serving, as mentioned above.